A global pandemic burns through the population leaving America in shambles. Sarah Washburn and her crew are forced to go on the run from an indefensible horde. Isolated in the Colorado high country, they’re pursued at every turn by mercenaries who want something they have. An impossible situation with low odds of survival, and their luck running out, they have one shot. A final chance to take a stand in a showdown that will alter the fate of the new world. Book 5 in an amazing zombie apocalypse series. Good story premise. Several returning characters. Alot of new characters are introduced. The narrator did a great job on this audio book which enhances your listening experience. I received this for free for an honest review. Another fun listen into the world of the five roads to texas world. Dr Sanjay,the betrayer, is betrayed,but by who?Things go to heck when the 'badder' guys try to find information they believe was stolen from Sanjays office.Andrew B Wehrlen does a nice job narrating this series.I was given this book by the narrator,author or publisher free for an honest review. 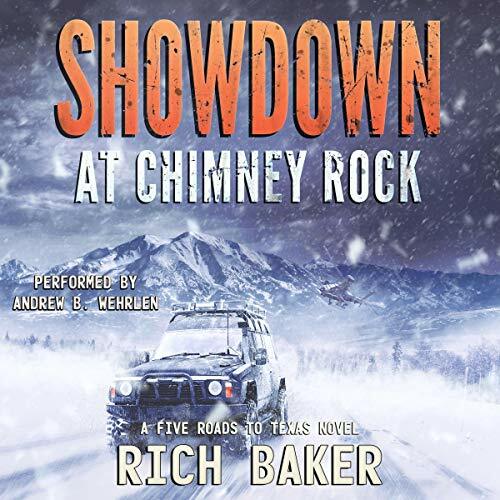 Showdown at Chimney Rock: Sarah's Run: A Five Roads To Texas Novel, Book 5. This is a must read series for anyone who likes Zombie type post apoc fiction. UltrB Wehrien's narration is excellent, his style is light hearted but gripping. I enjoyed listening to this book. The Narrator was excellent. I found Sarah to be likable and a strong woman heroine. I wish I would have had a chance to read the first 4 books of the series, I think it would have "come together" better for me. With that said, it still captured my attention and was an interesting, abet violent book. I would recommend this book for anyone in to the end of days theme. Warning: Language is not rated G.
I really enjoy this series and especially like all the POVs. Great narration! The first Iranian boots on American soil! Once again, the infected are on a rampage and their mean streak is showing. Virologist, Dr. Sanjay assembles some of his testing materials into a package to be delivered upstream to his peers for review. Unfortunately for everyone, a curious young man snatches the package, thus commencing a whole new account of murder and mayhem. Whatever was in that package, others wanted it, and wanted it badly. In the midst of a deadly epidemic, now our survivors had this to deal with. Good story with great characters. This audiobook was given by the author, narrator, or publisher at no cost in exchange for an unbiased review via Audiobook Boom. I have really enjoyed this series, and was so glad to see that it will continue. Andrew Wehrlen was flawless as the narrator. His voice is one you can't get enough of and can put a story over 5 stars.